Every month, we’ve been focusing on a state with particularly silly traffic laws. This month, we’ve found a few laws in California that are sure to make you chuckle a time or two. Seriously, what had to happen for people to see a need for some of them? Laws are put in place to protect us and to keep order in our society. Most of the laws we encounter do just that and are easily understood. Others, like the ones we’ve listed below, don’t really make sense! Don’t mind us while we have a little fun with some of the sillier ones! It’s a misdemeanor to shoot any type of game from a moving vehicle. Except whales. Whales are okay. No vehicle without a driver may exceed 60mph. Okay, but 59mph without a driver is perfectly legal! Women are not allowed to drive in a house coat. Are men not allowed to either? You must have a permit before parking your car on the street at night. How long do you have to be stopped for your car to be considered parked? 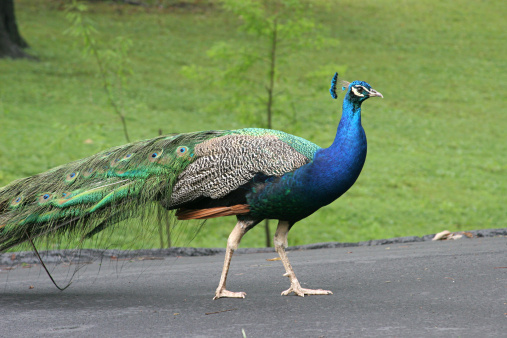 Peacocks always have the right of way, even while crossing driveways. So, stop for a peacock but you’ll have the right of way if it’s any other animal! In Cathedral City it is illegal to sleep in a parked vehicle? So it’s fine if the vehicle isn’t parked? Okay, we admit, we have a love for sarcasm but some of these laws were just too easy to poke a little fun at! Life is too short to be so serious all the time, and it’s too short to wait in long lines when you could be out doing other things. The way we see it, you should spend as little time with us as possible…even though we like you. Come see us today for fast, friendly service!